All guests must be eighteen (18) years or older. D.Tour Spa does not perform pregnancy massage. D.Tour’s ultra-private two-room suite allows you to spend time with someone special in your life. Choose one of our special packages for each person. Begin with your choice of a reflexology or scalp treatment. Enjoy a private soak together in our illuminated hydro-therapy tub, followed by self-applied MotorCity Mud. Rinse together in our double Rain shower, followed by our 50 minute MotorCity Music Massage. Begin with a D.Tour scrub to awaken the senses. Enjoy a private soak together in our illuminated hydro-therapy tub, followed by self-applied MotorCity Mud. Rinse together in our double Rain shower, followed by our Urban Escape Facial. *Ask for details on how you can upgrade your couple's suite package. Our Signature Massage, featuring high-tech and high-touch therapy. “SO Sound” speakers are embedded into the massage table allowing you to hear and feel the music. Profoundly relaxing and deeply soothing, balancing body and mind together. Extraordinary treatment utilizing micro-current technology. Facial muscles are effectively re-educated and repositioned. This non-invasive treatment instantly tones, lifts, and firms sagging muscles. Notice visible results after only one treatment. Enjoy beautifully engineered body treatments blending organic botanicals and essential oils. 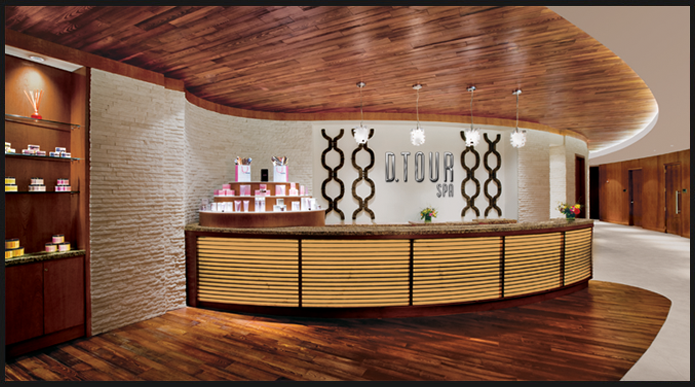 Our exquisite D.Tour body treatments offer the ultimate in hydration and detoxification. This wrap service will leave you relaxed with skin that you’ll just love to show off. Begin with a gentle full-body exfoliation using our MotorCity Mojito blend of oils that combines refreshing spearmint and lime wrapped around the exotic scent of ylang-ylang flowers. Warm cosmetic-grade clays draw toxins from the skin to refine texture and softness. 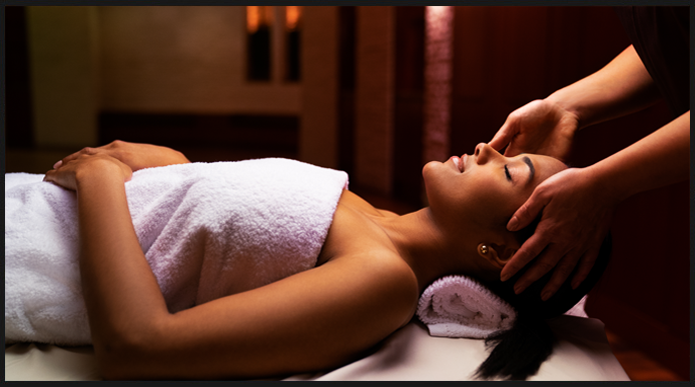 As you enjoy the clay wrap, receive a hypnotic hot oil hair treatment that will leave your hair shining and strong. After a brief shower, relax as a hydrating application of D.Tour Drive Shea Butter Cream is applied. First, a healing blend of rose, geranium, and rosewood is applied with a gentle full-body exfoliation. Then, a warm fusion of anti-inflammatory and remineralizing clays is smoothed onto your skin. As you relax in a warm cocoon wrap, you’ll experience an energizing facial massage. Following a brief shower, enjoy an application of Pink Cadillac Shea Butter Cream that will leave your skin satin soft and wonderfully hydrated. You’ll love this hydrating and anti-aging body experience. After preparing your skin with a fragrant prickly pear body polish, you’ll enjoy a hydrating pomegranate aloe gel mask. Then, while absorbing the skin healing goodness of a full body wrap, you’ll receive a prickly pear facial massage, followed by a jojoba butter massage to seal in the moisture. Pomegranate seeds are rich in punicic acid, a vital component of healthy skin, and one of Nature’s most potent anti-aging treasures. We use the natural power of native sage to soothe the body and refresh the spirit. Start with an aura-cleansing body scrub of fine ocean sage infused with wild and organic sages and lavenders to ease and relax body tension. Warm healing clays are then added to soothe the skin and draw toxins from the body. As you relax in a warm wrap, you’re treated to a soothing scalp massage, leaving you feeling energized and centered, followed by a hydrating application of Turquoise Sage Shea Butter Cream. Want to enhance muscle function and reduce stress? This treatment is both cleansing and detoxifying for the body, and can re-balance your magnesium levels. We begin with a sea algae enriched body polish, chosen for its toning, detoxifying and moisture retaining functions. This is followed by an application of our trans-dermal magnesium gel mask to restore your natural energy. We finish with an Ocean Dew lotion massage, scented with wild thyme, grapefruit and juniper oils to refresh and revive you. Exclusive, luxurious, and skin softening, our body exfoliation series is inspired by the powerful fusion of gentle sugar or salt granules and exotic botanicals. Our signature blend of spearmint, lime, and ylang-ylang is refreshing and relaxing to both body and mind. Our signature body polish blends skin conditioning aloe vera, jojoba, and fine cane sugar crystals to leave you feeling buffed to perfection. To lock in the hydration and keep your skin soft and glowing for days, we finish with our D.Tour Shea Body Butter Cream. Our Pink Cadillac Foaming Sugar Scrub uniquely conditions and refines your skin as it polishes. Tiny spheres of jojoba wax and ultra-fine sugar crystals are applied in a gelled jojoba matrix to gently remove dead skin cells and toxins that can clog pores and dull complexion. After making your skin supple and satin-soft, we apply a final touch of luxury with our organic rose, geranium and rosewood Pink Cadillac Body Butter Cream. This all-natural body scrub is made with fossilized salts mined from an ancient inland ocean. With over 80 essential minerals and trace elements, it’s perfect for the human body, matching its mineral balance like no other naturally occurring salt. These salts are drenched in organic oils of wild sage and lavender to purify, soothe, and relax, leaving you refreshed and reinvigorated. Turquoise Sage Body Butter Cream, rich in shea and aloe vera, completes the experience. Want to enhance muscle function and reduce stress? This treatment is both cleansing and detoxifying for the body, and can re-balance your magnesium levels. We begin with a sea algae enriched body polish, chosen for its toning, detoxifying and moisture retaining functions. We finish with an Ocean Dew lotion massage, scented with wild thyme, grapefruit and juniper oils to refresh and revive you. A specialized Clayton Shagal treatment to treat dehydrated, chapped, or weathered hands. Enjoy a deluxe massage with an intensive moisturizing complex bursting with natural botanicals to hydrate your skin. Exclusive D. Tour Scrub, Mud, and Lotion make these services a one-of-a-kind experience and include either a hand or foot paraffin treatment for ultimate hydration. Extracts of pomegranate and prickly pear flowers combine in this delicious hydrating and anti-aging treatment for hands and feet. A sugar scrub blend of Rose, Geranium, Rosewood and Evening Primrose invites healing and regeneration. Relax as your cuticles and nails are detailed and shaped before a scrub smooths and softens your skin, then a moisturizing massage hydrates your skin. An extended wear gel manicure that lasts up to 14 days. Service includes nail shaping, cuticle care and polish. “Flash Dry” finish to keep nails from smudging as you dash out the door. We have specifically designed detailing treatments especially for men in our private rooms. Service upgrades can be added to any manicure or pedicure. 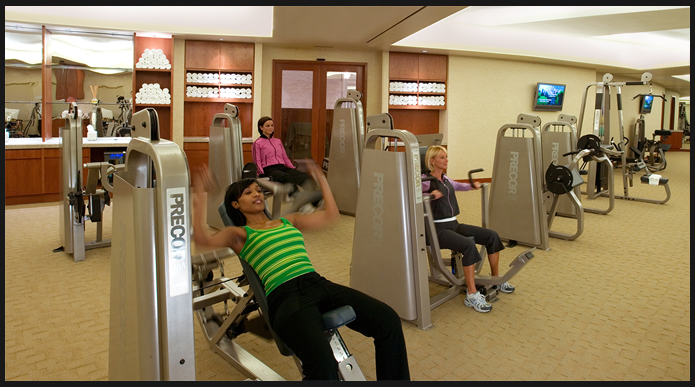 Innovative, dynamic, and exclusive spa services are expertly delivered by our highly-skilled body work specialists. Ultimate relaxation using light to medium pressure with long, fluid strokes. Great for first-time spa-goers. Works the deeper structures of the muscles to alleviate knots and tension. Hot Stone Massage combines classic Swedish massage techniques with warm, smooth basalt stones to bring relief to tense muscles, sore joints, and stressed emotions. Deep heat allows you to experience complete relaxation and balance. Spend time with someone special and enjoy massages together in our couple’s suite. Choose either Swedish or Deep Tissue. Enjoy a massage with our customized aromatherapy oils. Select one of three oils blends that will release feelings of stress, ease tension or boost immunity. Specialized pressure-point massage techniques work the hands and feet to release tension and restore proper energy flow to the body. Deep, penetrating massage designed to loosen the joints and muscles. A rare, super-critical extract of Mountain Arnica is blended with organic herbal oils to further promote blood flow into muscles and joints, easing discomfort and supporting repair. Enhancements are service upgrades that can be added to any massage treatment. We’re proud to feature the CACI International Quantum, a world-renowned aesthetic system that combines premier skin care technologies to treat and combat the various signs of aging. Featuring micro-current, which performs the acclaimed non-surgical face-lift, this technology is unparalleled in the industry. Extraordinary treatment utilizing micro-current technology where facial muscles are effectively re-educated and repositioned. This non-invasive treatment instantly tones, lifts and firms sagging muscles. Notice visible results after only one treatment! Our Micro-current therapy replenishes and lifts the eyes. See visible results in minutes. Feel refreshed and ready for that special occasion. This is the ultimate in facial care. We combine our Anti-Aging Facial with our D.Tour Signature Non-Surgical Face-lift Facial for ultimate care for your skin. Deep cleansing, exfoliating, and masking will prepare the skin for the next step, which will instantly tone, lift, and firm your facial muscles. A series of 10 to 12 Signature treatments is recommended to achieve long-term results. Our classic facials use the La Maison Clayton Shagal Skin Care Line whose belief is simple: cleanse to prepare the skin, nourish to stimulate cell regeneration, and moisturize and protect the skin. An excellent introduction to Clayton Shagal’s specialized active based gels Collagen, Elastin, and Hyprocel. Ideal for all skin types. An ideal hydrating treatment for dehydrated or mature skin. This treatment prepares the skin using a combination of exfoliants to ensure maximum penetration of Clayton Shagal’s active ingredients, then utilizes both collagen and elastin extracts and gels to nourish and strengthen the collagen and elastin fibrils, thus increasing moisture retention. An excellent treatment focused on the deep cleansing of congested skin—seborrheic and oily skin types. This treatment highlights the use of the Clayton Shagal AHA Scrub at 20% concentration, Acnose Lotion Cleanser, Refirming Mask, and Acnose Ultra Matifying Cream to restore skin clarity, tone, and texture. Get a healthier complexion with this treatment designed to brighten and enliven your skin tone. An excellent treatment for guests with hyperpigmentation. An express facial treatment for busy individuals with all skin types that introduces the use of collagen and elastin gels. This customized facial caters to the needs of a man’s skin with special attention to thorough cleansing of sensitive shaving areas, restoring moisture and soothing the skin leaving it refreshed and hydrated. Enhancements are service upgrades that can be added to any facial treatments. Skin Rejuvenation Treatment using 15% glycolic acid to restore your skin to a healthier, younger state. Most neglected part of the body needs special attention. Our back facial involves cleansing, exfoliation, followed by gentle extractions, a relaxing massage and a specialized treatment mask. Deep, penetrating massage designed to loosen the joints and muscles. A rare super-critical CO2 extract of Mountain Arnica is blended with organic herbal oils to further promote blood flow into muscles and joints, easing discomfort and supporting repair. This customized facial caters to the needs of a man’s skin, with special attention to thorough cleansing of sensitive shaving areas, restoring moisture and soothing the skin leaving it refreshed and hydrated. which may, at times differ from our printed brochure.